Spa Trouvé is excited to offer Profound treatments in our Utah spas. Profound is a minimally invasive treatment designed to help people who have sagging skin and loss of volume around the mouth, cheeks, and neck. How Are Profound Skin Treatments Performed? During a Profound skin treatment at our Utah spas a handheld device with tiny needles is placed on your skin. It uses radio-frequency technology, and heat is released at a precise temperature and depth into your skin. Who is a Candidate for Profound Skin Treatments? Most of the population experiences signs of aging due to losing skin elasticity. The skin typically begins to sag around the face, jawline and neck. Intrinsic aging, also known as the natural aging process, is a continuous process that normally begins in our mid-20s. Most premature aging is caused by sun exposure (photo-aging). Other external factors that prematurely age our skin are repetitive facial expressions, gravity, sleeping positions, and smoking. Even if you are religious about applying the best medical grade sunscreens, keeping up on your skincare regime, and eating/exercising healthily, you will probably notice some loss of elasticity of your skin. 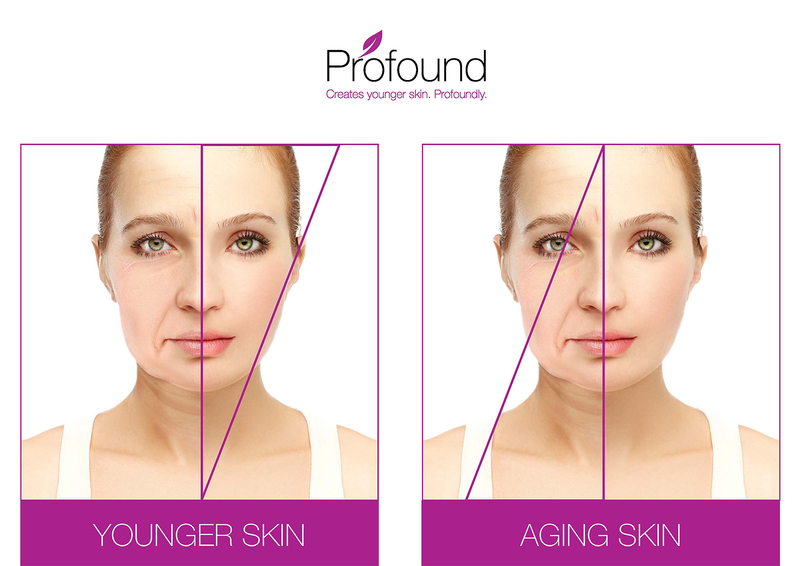 You’re in luck though… Profound is here to help reduce the effects of aging. Profound is completely customizable and minimally invasive. It’s suitable for men and women who wish to target the key signs of aging and reduce the appearance of cellulite on the body. The most ideal candidates for Profound include people who suffer from loss of vital skin elements due to genetics, environmental factors and have experienced a loss of volume, wrinkles, and have noticed decreased elasticity. Profound works by helping the skin to build collagen and elastin. Profound heats the skin to an exact temperature and depth for an exact amount of time, delivering precise energy to the deeper skin layers, where it is most beneficial. No surgery, no injectables; just your body’s own collagen and elastin to help you turn back the clock on aging. How do I prepare for a Profound treatment? What is the recovery for Profound Treatments like? The treatment area after a Profound procedure in Utah will appear red and swollen right after the treatment. We recommend icing the area as needed for approximately 24 hours. Redness and swelling typically subsides after 102 days after Profound Treatments. Your Profound Treatment Expert will give you full instructions for post-treatment care. Do Profound Skin Treatments in Utah hurt? Everyone handles pain differently, but the pain has been described by many of our clients as very comparable to our other Utah microneedling treatments. Many experience mild discomfort while some do not experience any pain at all. WHERE CAN I GET A PROFOUND TREATMENT? Our Utah spas are so excited to show you how Profound treatments can change your skin! Come to our spa in Draper, Utah for a Profound treatment today! Interested in a free Utah Profound consultation? Call us today to get it scheduled!